After the show, he drops off his (knowing) beard, Lila Lion, and has his driver bring him to the Village. Well, there's no way that Parker's pessimism could possibly have a point about SP's life, could it? Interesting... 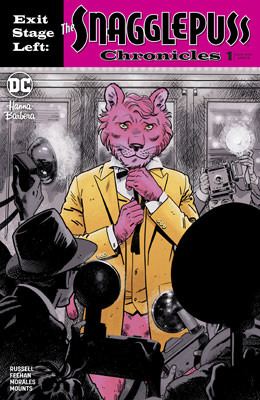 I don't really know much of anything about the original Snagglepuss cartoons or comics, but I see what they're going for here. Also, I like Dorothy Parker's bon mots. Russel's Parker feels so perfectly accurate. 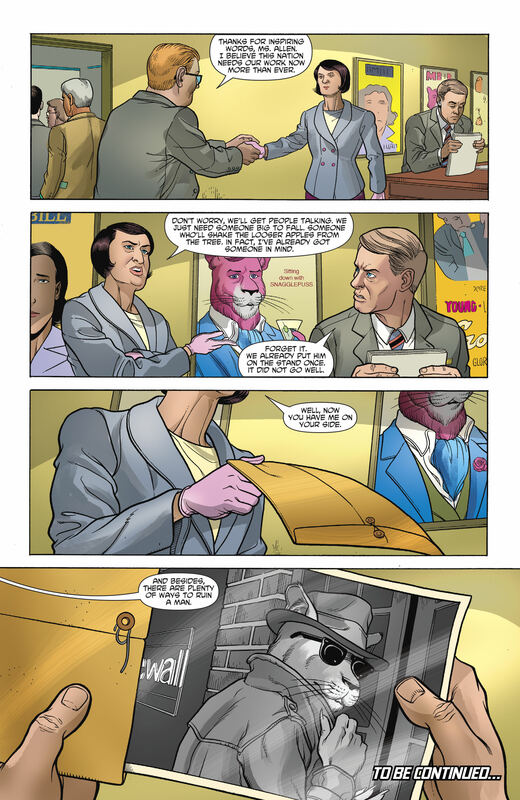 The easiest way to describe the original Snagglepuss is that... he acted like a lion of refined taste and a gentleman. in other words flamboyant as all hell (or as flamboyant as 50's TV-animation budget with very limited movement allowed...). plots usually involved him wanting to make his cave more inhabitable. 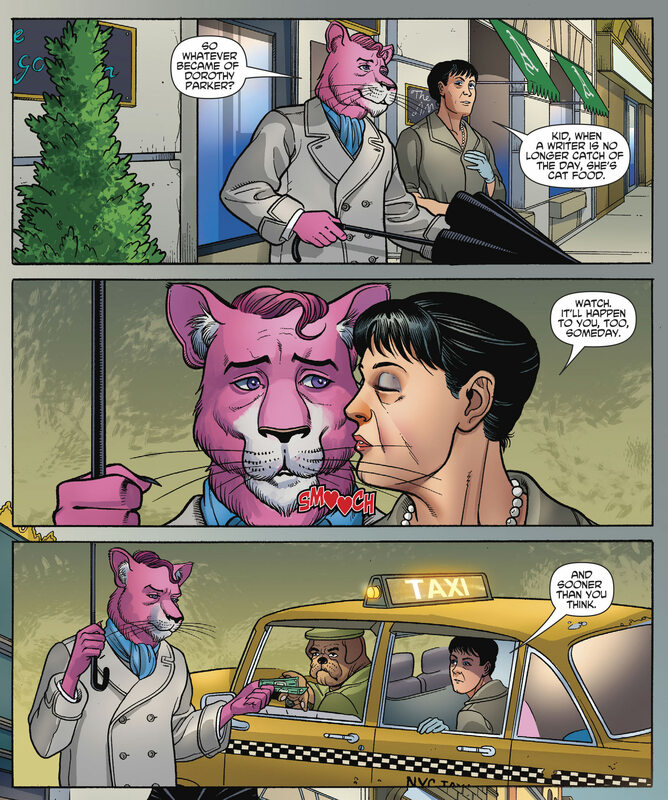 Naturally, a lot of people believed he was gay and was given a love interest in response, also known as the "Batwoman syndrome" (her name is Lila and I assume she is the pink lionness in the play). The Pink Panther cartoons featured him as a silent protagonist, just trying to get through life but having misadventures anyway. Sometimes he was the straight man, and sometimes the funny, but he rarely seemed particularly flamboyant outside of the Pink Panther films. 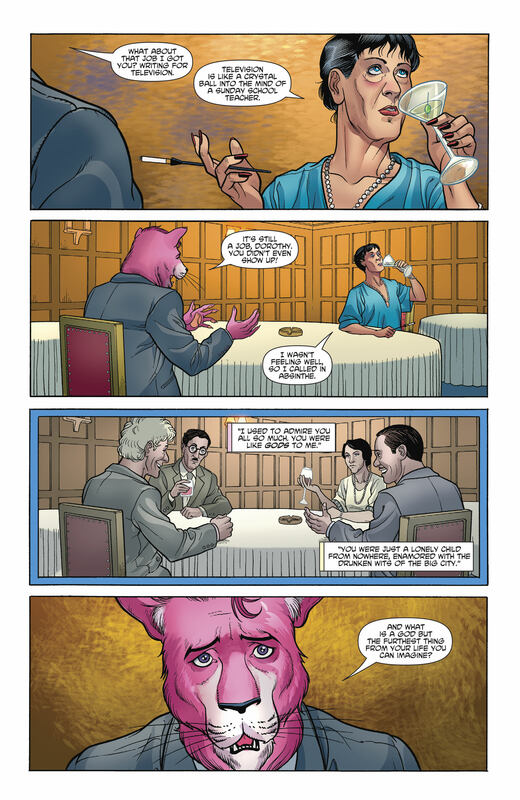 I do distinctly remember an image of him with one of those long cigarrette holders, which I often associate with women and flamboyant men... hell snagglepuss uses one in this very comic. 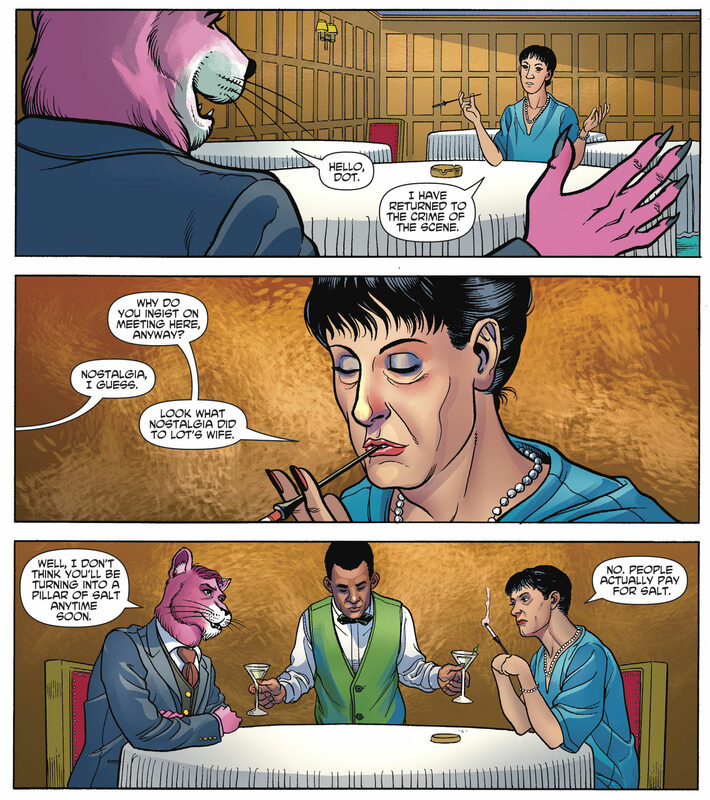 Then again, my point was more that any resemblance with the pink panther is mostly a huge coincidence and him not being flamboyant does support my point. He was likely using a cigarette holder from one of the opening sequences of those films. However, my main intent was to clear up any confusion about the Pink Panther cartoons, not to argue your point. 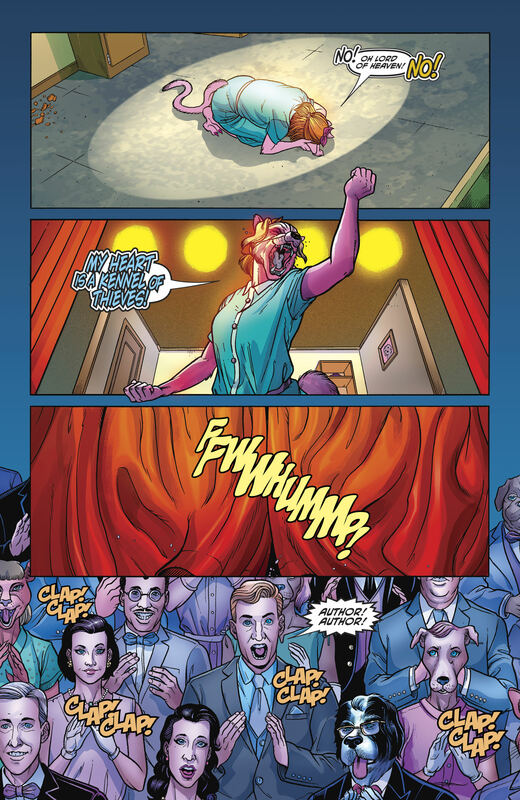 Snagglepuss definitely debuted well before the Pink Panther. Was Dorothy Parker once of those "Television is furniture" types? Not quite sure what that means, except in terms of TV isn't real art. Dorothy Parker was a poet, a critic, a playwright and a satirist who had a legendarily sharp and rather caustic wit, and a nice line is self deprecation. She filled in as a theatre critic when PG Wodehouse (whose role that normally was) was taking a holiday, if that helps. She never wrote for TV but did some work for radio, so I'm not sure she'dhaave objected. I have a deal of sympathy with her on that one. I do remember there was some conflict with Television because it was felt re-runs would ruin theathre and leave actors without a job (theathre actors would make the play ONCE and then to hell with them). I don't know if writers felt the same, though. Writers would probably be happy, since they'd be paid by the week. If you ever get a chance to read author and playweights Helene Hanff's books about her life in the less showy side of showbiz (and the brilliant "84 Charing Cross Road" about her "pen-pal" relationship with the staff of a London bookshop, made into an excellent film with Ann Bancroft and Anthony Hopkins) I do recommend you do. That's when you go reverse whodunnit. When I did speech tournaments, her "The Waltz" was my go-to piece for Humorous Interpretation. The full quote is “Theatre is life, film is art, and television is furniture.” No one seems to know who said it first. I honestly don't know Parker's attitude toward TV in general (or if she was ever given and blew off a job in TV), but I can certainly see her chafing against the moral guardians that she'd have to work under. 1988 pixels is a bit on the wide side.